The last two weeks there have been many hours volunteering in Slevdalsvann nature reserve. After we have received a permit from the environmental protection law for ringing in a limited area, 10-12 local volunteers have been working worked on arrangements in the area. This had to be done before the breeding season begins. Lista Bird Observatory started in autumn 2015 develoving ringing activities at Ammo area near Slevdalsvann, just outside the reserve. 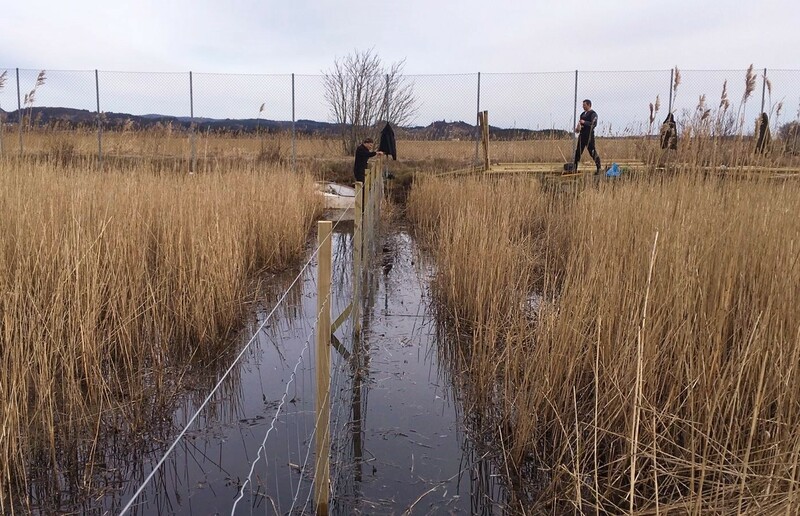 The reason why we want to ring within the reserve is that some species which are strongly associated with reedbeds are not captured by the nets outside the reserve. We believe that the ringing in this new area will provide new knowledge about the bird life in Slevdalsvann, which will be useful for the future management of the area. The permission for ringing is only applied during the autumn season. According to the authorisation the area is locked and only allowed for ringers.